In a great variety of moist or rarely upland forests; borders of bogs and swamps; coniferous swamps and wet hollows; occasionally in bogs and on shores. Immature specimens of C. seorsa in sect. Stellulatae may resemble this species, but have smooth (not serrulate) beaks. The perigynia of C. brunnescens tend to be more definitely beaked than the merely apiculate ones of C. canescens, but the distinction is subtle. Most of our specimens are the lax, narrow leaved (leaves ca. 1–1.5 mm wide) North American subsp. sphaerostachya (Tuck.) Kalela. 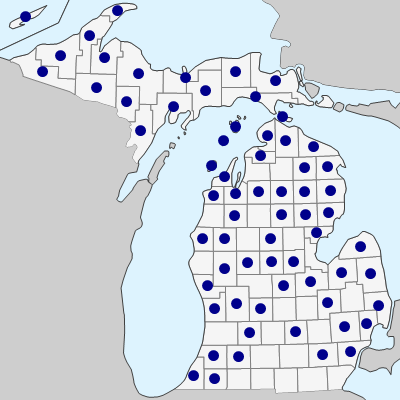 Some specimens, mostly from the Upper Peninsula, appear to be the circumboreal subsp. brunnescens; they are more upright plants with leaves ca. 2 mm wide. Separation of the two, however, is by no means always clear in Michigan. MICHIGAN FLORA ONLINE. A. A. Reznicek, E. G. Voss, & B. S. Walters. February 2011. University of Michigan. Web. 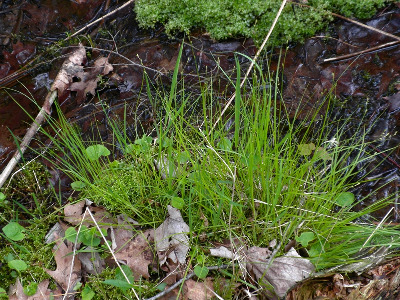 April 19, 2019. https://michiganflora.net/species.aspx?id=922.